The spark plug creates the spark that drives your Kohler-powered equipment. While your Kohler 3000 Series 6.5 HP or 25 HP engine runs, carbon builds up around the spark plug. This can cause the spark from the spark plug to weaken, causing your engine to perform poorly. Beyond carbon buildup, the spark plug of your Kohler engine wears as the engine runs. When the spark plug is worn, complete combustion does not occur and fuel is expelled through the exhaust system, which results in a black smoke cloud. Therefore, replacing your spark plug, whether it is a Kohler 7000 series spark plug or any other, after a certain amount of use is a wise decision. Clean the area around the installed spark plug with the can of compressed air. You need to ensure that no debris can fall into the engine when you remove the spark plug. Pull the spark plug wire from the end of the spark plug. You may need to pull rather hard to release the inner clamp of the spark plug wire from the contact of the spark plug. Attach the spark plug socket to the 3/8-inch drive ratchet handle, set the direction of the ratchet handle to reverse and remove the spark plug from the engine. Clean the threaded end of the spark plug with a soft wire brush to remove carbon buildup and inspect the end of the spark plug for signs of wear. Signs of wear include a melted contact, which is located at the end of the spark plug threads, and cracked ceramic located directly above the threads. 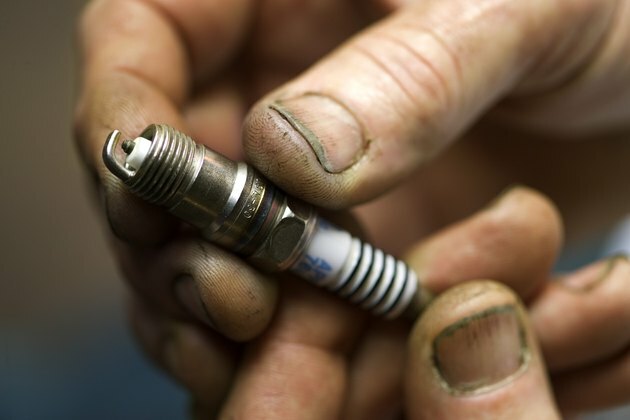 If you see any signs of wear, replace the spark plug. Set the gap of the spark plug to the gap specified by your Kohler 25 HP engine operating manual with the spark plug feeler, or wire-gauge. To set a spark plug gap, simply slide the correct-width tap on the spark plug feeler gauge between the gap of the spark plug and the grounding electrode. The grounding electrode is the thin metal arm located at the bottom of the spark plug. Thread the spark plug back into the engine by turning the spark plug clockwise by hand. Attach the spark plug socket onto the end of the 3/8-inch drive torque wrench and set the torque wrench to the torque specified in the engine operation manual, usually between 18 and 22 foot-lb. of torque. Push the end of the plug wire back onto the spark plug after you have the spark plug set to the proper torque.